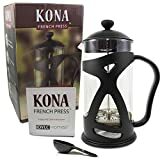 French press coffee makers can be used to brew hot or cold coffee. Once the coffee has steeped, just depress the plunger and capture the grounds, leaving the coffee ready to pour. While French press coffee-making is fairly simple, you do need to care properly for your pot. Your French press filter is an important part of the plunger mechanism and needs to be rinsed each time you use the coffee maker. Per authorities at Coffee Brew Guides, warm water and a little pressure from your fingers can remove any stuck grounds. If possible, separate the filter from the plunger so you can rinse it thoroughly. Most French press coffee makers feature a glass carafe. When cleaning a French press, take care not to scratch your carafe; scratches on the inside of the glass may impede the action of the plunger. Once you've enjoyed your fresh pressed coffee, dump out the grounds and rinse the carafe. Use a non-abrasive sponge or cloth with a dab of soap on it to wipe out the inside and outside of the carafe. Rinse thoroughly and allow it to air dry. The structural disc sits at the bottom of the plunger and is often made of a hard rubber or plastic (some are metal), formed to hold the filter. It may be a part of the filter, depending on your style of press. This material should not be washed with soap as it may absorb the flavors or scents in the soap. Rinse it thoroughly when you clean the filter and allow it to air dry. Depending on the style of French press, the lid and the plunger may be joined as one unit. The metal portions of the plunger can be wiped with a cloth with a little soap, or just wiped with a damp sponge or cloth. The lid of your French press may be plastic and should not be treated with soap. Never force the plunger! Back it out a bit and press again. Too small a grind will result in fine grounds that may catch between the plunger and the rim of the press, causing a jam. A jammed French press can shatter if you apply too much pressure. If you run your dishwasher daily, portions of your French press can probably go through the dishwasher with no problem. French press coffee is made with a coarse grind of coffee grounds. Regular drip ground coffee or anything finer (such as a cappuccino grind) will leave your with bitter, grainy coffee. When you mix your coarse grind coffee with hot water in the carafe, be sure to stir it so it's fully incorporated into the water for consistent flavor. This also helps prevent problems when cleaning a French press.